Colorado is a risky place to grow apples. With temperatures fluctuating year-round, crop yields hit-or-miss situation with farmers and later on—cidermakers. Ian Capps, Head Cidermaker/Lead Singer over at Stem Ciders, has seen it all. Capps, a science geek from the start, studied environmental sciences and biology at CU, and while in school, fell into his passion by befriending a couple of brewers from Avery Brewing Company. “Talking to my buddies over at Avery, I realized that they had the jobs I really wanted,” says Capps, and his creativity wheels started turning. 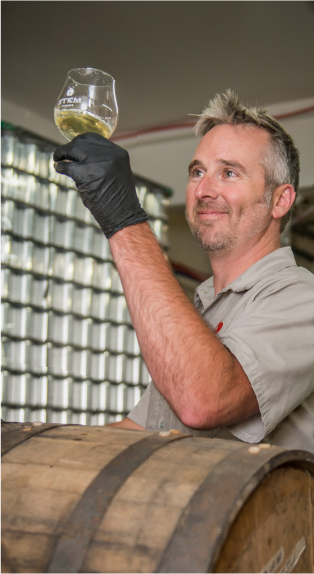 When he graduated in 2010, he applied for bio lab jobs…and a few local brewery jobs. He ended up getting a job distilling over at Stranahans, and then moved on to brewing at Epic over in RiNo, and in 2015, landed a job at Stem: “It was kind of a steep learning curve coming from distillation, to brewing, and then to cidermaking,” he notes. Despite the challenge, he learned the ropes, earned his place, and now, mindfully runs the show behind-the-scenes at Stem. With such a high volume business (Stem produced over 100,000 gallons of cider last year) Stem doesn’t have the capacity at the moment to grow their own apples or press their own juice, but Capps keeps a close eye on sustainability throughout the production process with Stem. It all starts on the farms that Stem sources its juice from: “All of the apples that we use are considered seconds,” he says—which means that these apples are essentially gleaned, and either have fallen off the tree, didn’t grow into ‘picture perfect,’ uniform apple shapes, or show blemishes and dings that doesn’t make the cut with grocery store standards. Once the apples are pressed, the remaining matter left in the apple press is called pomace. All of the pomace from Stem’s apple juice—which could potentially be tossed away—is either used as feed for livestock, or is spread out as a highly acidic pesticide to deter unwanted bugs. Not to mention, says Capps, that cidermaking requires less input or energy to produce, because cider doesn’t require a boiler, and it doesn’t need as much natural gas or water as brewing does. Although most of the ciders over at Stem derive from apples outside the state for consistency reasons, one in particular fizzes Capps’ excitement: Crabby Neighbor. It’s made humbly with all Colorado fruit: some Crab and Granny Smith apple juices from the Hotchkiss area of Colorado. It’s a delicate cider: crisp, dry, floral, and has a high acidic content that requires special high ester yeast to balance out tartness and highlight the nuance aromas. On average, Capps notes, Crabby Neighbor has a 2 ½ – 3 week brewing method. It ferments for around 10-11 days to zero-out the sugar content and convert it into alcohol. It’s then racked or pumped from tank to tank for a bit to separate the leaves, sticks, stones, or any other unwanted solids from the good stuff. After racking, the cider ages for an additional 5-6 days in stainless steel tanks before being distributed to consumers.